Certain types of dental work require some level of sedation, and selecting the right one can be challenging if you’ve never experienced it before. Whether it’s a simple root canal or something more invasive like receiving dental implants, choosing the right sedation is an important part of planning your procedure. There are several types of dental sedation available. IV sedation is a common method used when inducing general anesthesia, the kind that puts you fully ‘under’, leaving you unconscious during the procedure. While general anesthesia is the most common use for IV sedation, you and your dentist can choose an appropriate level of sedation for your procedure. IV sedation works quickly since it is directly administered into your blood stream. Oral sedation also comes in multiple levels, but its most common use is a light sedation involving the use of Valium or Halcion. This type of sedation is commonly used for patients who experience dental anxiety or who have difficulty sitting still for the duration necessary. This latter property is what makes it a popular selection for procedures involving children. It has the additional benefit of having a low rate of side-effects. 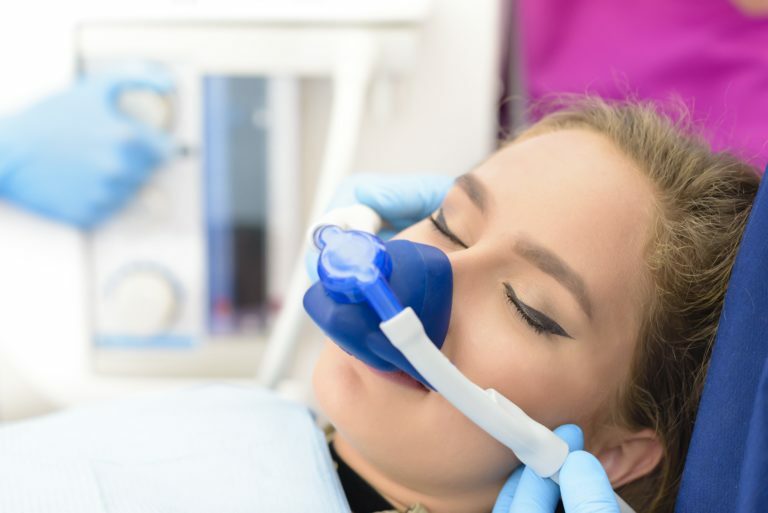 If you’ve ever heard the term ‘laughing gas’ before, then you’ve heard of inhalation sedation. This gas, properly known as nitrous oxide, is commonly used in patients who need help relaxing during their procedure. It has the benefit of wearing off quickly and being able to be adjusted to the needs of the patient, making it possible to drive home soon after the procedure. All three forms of sedation are available at most dental offices, though some insurance providers will only cover intravenous and general sedation for specific procedures. It’s important to speak to your insurance provider and your dental office to determine what level of sedation is appropriate for your procedure and whether or not it will be covered. Many people are nervous when experiencing dental work, but dental anxiety refers to a condition where simple nervousness has turned into a full-blown phobia. This condition is known as Odontophobia, and has a tendency to increase in severity if it isn’t treated properly. If you find yourself becoming extremely nervous, to the point of having an anxiety attack, when considering going to the dentist, it may be time to speak to a mental health specialist about your condition. Inhalation and oral sedation are the common forms indicated for patients suffering from this condition. If you’re preparing for a procedure that requires the administration of sedation, or are experiencing dental anxiety and want to know if sedation is appropriate for your case, it’s time to make a call. Start by picking up the phone and calling Dr. Shadi Heidarian at Heritage Park Dental in Palo Alto, CA and schedule a consultation. During your consultation you can discuss your procedure and the available sedation methods for it, as well as determine if it’s necessary to get a mental health professional involved to establish a case for sedation when it typically isn’t indicated by the procedure.